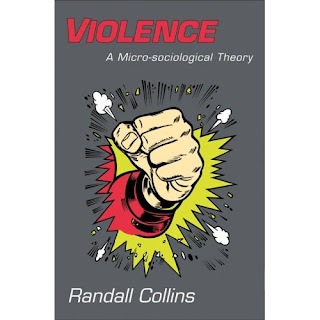 Randall Collins has a book out: "Violence: A Micro-sociological Theory." Its premise is that popular music has reshaped high school status networks. As popular music consumption became the central identifying point of youth cultures, it also came to support greater pluralism in student status hierarchies, punk and other alternative culture groups acquired their own venues where they could generate their own collective effervescence, dominating in their own emotional attention spaces. Moshers became the leading edge of punk culture, the attention-getters within their chief cultural rituals and gathering places. Not surprisingly, there is strong antagonism between moshers and jocks, their chief counterparts in the use of controlled violence in the conventional youth culture. It could be an interesting read for those intrigued by the immediate effects of popular culture. And those who still think punk music and punk culture is inconsequential, well.... Perhaps these folks will find this new text particularly informative. Right on. Moshers are as present as the careful students and scholars, no...? Wll read it. /perceived-attractiveness relations. The complete lack of these relations is what I liked the most about my high school experience. I wonder if the musical cast system has replaced or is just an add-on to the old one. Right. Music appreciation is not always strictly contextual.